June 13 is Anthony of Padua Feast Day, who is a marriage saint in Portugal, Spain and Brazil. This feast is very important for these countries. 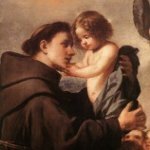 Anthony of Padua (Fernando Martins de Bulhões) was born on August 15, 1195. Anthony was born in a wealthy family, but at the age of 15 he decided to study theology and Latin. Later he joined the Franciscans and adopted a new name – Anthony (for the name of the chapel dedicated to Saint Anthony the Great). The death of Anthony is surrounded by various legends. One of them says, that children cried and all the bells of the churches rang of their own accord, when Anthony died. Another says, that Anthony was buried in a chapel. A large basilica was built to honor him, where his tongue was displayed for veneration in a large reliquary. Saint Anthony is a patron saint of Lisbon and Padua (the places of his birth and death). The feast of St. Anthony is a municipal holiday in Lisbon and it is celebrated with marriages and parades.